Matt Berman has been frozen in iMusical's carbonite since 2008. Matt Berman has been making up songs since childhood, but he has gotten to do it publicly since 2008, when his strong ear for music and complete inability to remember actual lyrics finally paid off with an invitation to join iMusical. 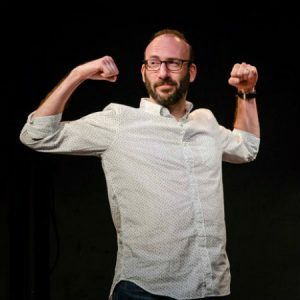 Matt studied improv in Los Angeles with The Groundlings and in Washington, DC with Washington Improv Theater. Matt also performs with itinerant samurai improv troupe Yojimprov, balding improv supergroup The Four Heads, and Hot Damn!, and occasionally assembles Ken Burns Presents for an improvised take on the American experience. He is a former member of The Score and Nox!, as well as the long-defunct, badly-named, and probably rightly unmourned Psychochuckles.